Recently while discussing how to use FTP to upload files to WordPress, one of our users asked us to recommended the FTP clients for Windows and Mac. There are plenty of free and paid FTP clients available. 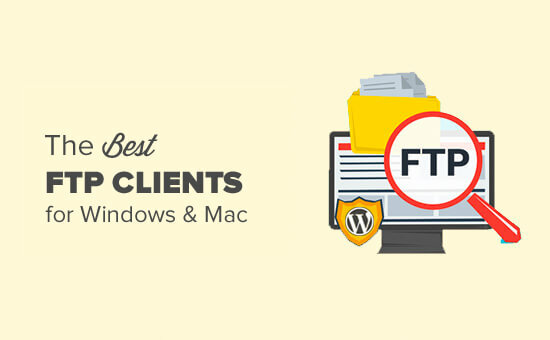 In this article, we have hand-picked some of the best FTP clients for WordPress beginners. The goal here is to find the most reliable, secure, and easy to use FTP tool for all your WordPress file editing and uploads. What is an FTP Client? Why You Need it? FTP (File Transfer Protocol) allows you to upload files from your computer to your WordPress site. In order to use FTP, you will need an FTP client which is a desktop app that connects your computer to your WordPress hosting account. It provides an easy to use graphics user interface, so that you can perform all FTP functions such as copy, upload, delete, rename, and edit files / folders on your WordPress site. It is not necessary to install an FTP client to use WordPress. However, an FTP client can help you quickly fix common WordPress errors when you are not able to access WordPress admin area. You will need a FTP username and password in order to connect to your WordPress site. This information can be found in the email you got when you first started your blog and signed up for a web hosting account. You can also get this information from your web hosting cPanel dashboard or ask the support, and they will email it to you. Once you have this information, you can connect to your website. First, you will need to launch your FTP client and enter your FTP username, password, host (usually your website address e.g. wpbeginner.com), and then click on the connect button. Host is usually your website’s URL (e.g. wpbeginner.com). If you do not enter anything in the port field, then your FTP client will connect using the plain FTP protocol on port 21. You can use port 22 to connect to your server using SFTP which encrypts information before sending it to your web server. This reduces the chances of hackers stealing your FTP password or sniffing on information. 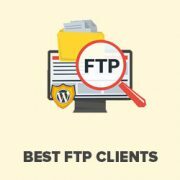 Having said that, let’s take a look at some of the best FTP clients available for WordPress users on different platforms. There are several paid and free FTP clients available for different platforms and operating systems. Each one of them comes with an easy to use interface and additional features that will make it easier for you to edit WordPress files. 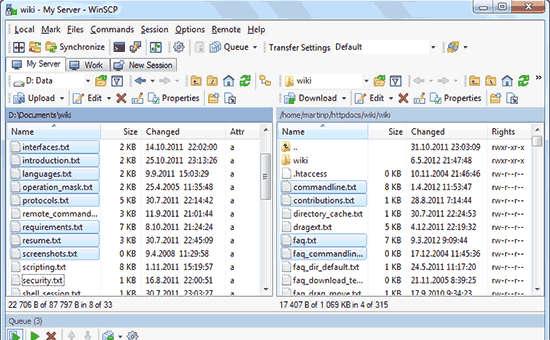 WinSCP is one of the most powerful and easy to use FTP client for Windows users. It feels like there are too many things on the user interface, but it is actually quite easy to learn. On your left, you have the files on your computer and on the right, you see the files on your server. Just click on a file to download, upload, or edit it. For advanced users, WinSCP has all the features that you would need from a powerful FTP client. It supports SFTP, SSH, and of course the plain old FTP. 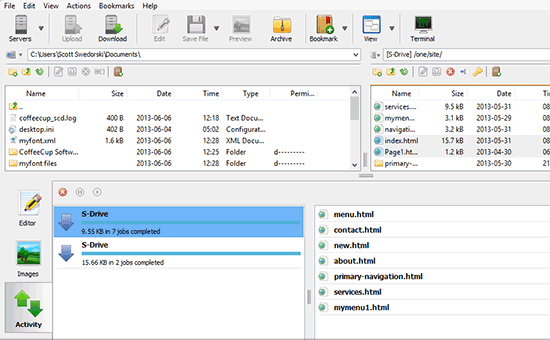 Handling files and assigning default editors is quite easy with WinSCP. CyberDuck is an extremely easy to use FTP client suitable for beginners as well as advanced users. It is available for Mac and Windows computers. Unlike other cross platform applications, it actually integrates beautifully with your native Mac environment. It also supports Mac features like storing your login credentials in keychain and locating files in finder. You can select your preferred code editor and open files for editing with the click of a button. Transmit is the most popular FTP client for Mac, particularly among web developers. It comes with an extremely powerful set of features like folder syncing, disk feature, and higher speeds. Transmit beautifully integrates into your native Mac environment which makes it super easy for Mac users to learn quickly. You can add your transmit shortcuts to Finder as favorites and quickly access them. It supports SSH, SFTP, FTP, FTPs connections. It also comes with a neat code editor for quick file edits. Free FTP by Coffee House is a popular FTP client among Windows users. It is very beginner friendly and quite easy to use. It supports FTP, SFTP, FTPS, and beautifully integrates into your operating system. It has a history feature which allows you to remember where you stored a file. There is a paid version available as well which is called Direct FTP. It has extra features like code editor, autocompletion, image viewer, etc. 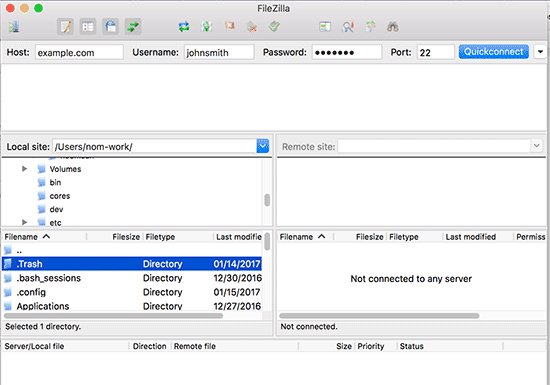 FileZilla is a popular free FTP client for Windows, Mac, and Linux. It is perhaps, the most easy to use FTP client. However, the reason we have placed it on the fifth position is because Windows users have reportedly found adware or spyware packaged into FileZilla downloads. You can uncheck the box during the installation to opt-out from adware, but since many of our users are beginners, we are afraid that they may miss it and eventually end up with an adware on their computer. Our experienced users can install FileZilla from official website. 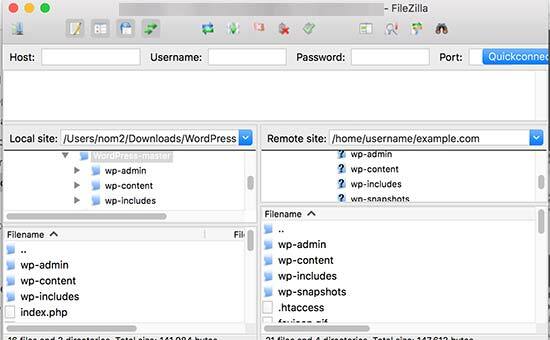 Linux users will find Filezilla available in their distro’s official repositories. WS_FTP Professional is a popular commercial FTP client for Windows. It offers enterprise grade security with SSH, and 256-bit AES, FIPS 140-2 validated cryptography and OpenPGP file encryption for transfers. It comes with powerful file search, drag and drop transfers, faster speeds, scheduled transfers, and many more advanced features. 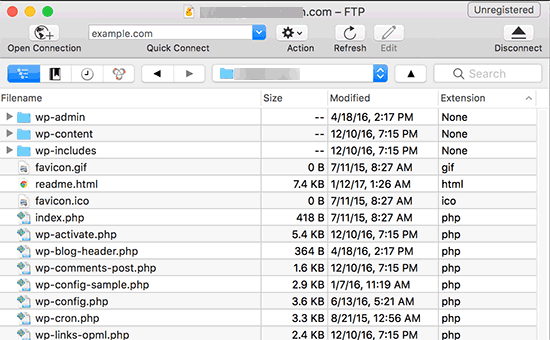 We hope this article helped you find the best FTP client for uploading files to WordPress. You may also want to take a look at our beginner’s guide to pasting code snippets in WordPress. Don’t know the others, but FileZilla? It’s such a piece of crap, whoever hacks this thing together should be locked up. Good grieve. Dear sir .I have buy a domain hosting from host gator .I have installed a theme in its.there are so many custom template in theme ..now I have downloaded free template.of word press .I want to add or install in my web or theme..if how my new template can see on page attribute..how can I add this template in my new pages.pls guide..I am not from it field..
Hello! this website has been very helpful to me however I have a potentially dumb question. I am not using a web hosting service yet but would still like to edit my site. How can I do that and if I need to use an FTP client still how do I connect my site to the FTP client without a web host. You can install WordPress on your computer and then instead of using FTP you can just use file explorer or finder to locate and edit the WordPress files. My computer won’t even let me go to the site that hosts Filezilla. Just gives me warnings and red pages and refuses to go there. LOL Now I know why. I used to use Filezilla a lot. But I think I’ll try the others now. I tried Cyberduck but found it difficult to use. One of the issues I had with it is that despite my best efforts to highlight the folder I wanted it kept uploading files to the “etc” folder or elsewhere in the file manager than where I wanted it to go so I had to move files again after uploading. I also found it got in it’s own way a lot. I recall using Smart FTP a while back but now I have a Mac I’ll try one of the other Mac ones. Please is there any mobile FTP: I mean mobile FTP application that we can use on android? As Richard noted there is a definite and long standing issue with Filezilla and password security which the author has no intention of ever fixing. Fortunately now there is a fork of the original called Filezilla Secure. Nice post. The best FTP client is winscp : you can set a master password when saving your FTP passwords. Even if a hacker steals the .ini file – where accounts are saved – he can’t do anything ! I used to work with filezilla but oneday a hacker stole my config file and hacked all my websites !! So be careful when saving passwords !!! Filezilla should be removed from any recommendation list as long as they pack spyware or any other malware with the product. A vote here for WebDrive. It should definitely be mentioned here. Its funny to see that Cyberduck is a free open source software on their official site but it charges 23 USD on Mac App Store. I wonder why? Is it a different package? The only CyberDuck I can find is for Mac $24?? Where can I find the Open Source version? You can download the free version from CyberDuck’s official website. Look in the left sidebar, you will find a download link for mac, just above the Mac store button. YummyFTP is amazing for OSX. Can use your keychain for passwords. YummyFTP is really good and I used it happily for years. I started with Transmit but didn’t like it very much. It was v3 though, and it changed a lot since then. Now my favorite is ForkLift. It’s so good that I don’t even try anything else : it suits my needs perfectly. FireFTP is the best. The more you can do in the browser the better. Filezilla’s throwing in spyware? Lame. That seems to be the life-cycle of great freeware, though, doesn’t it? Sooner or later, enough people are using it that someone offers them a bunch of money to slip in a little extra software, and then there’s the slow slide into obscurity. Filezilla is a sourceforge product. You should read up on the review of it. I have been a fan of Transmit and Filezilla for a long time, but recently I have been using sFTP app for Chrome. Liking it because it can go with me most everywhere I have Chrome, including my ChromeBook! No affiliation or anything, just find it really handy. SmartFTP is one of the best around and I’ve used it for years now, after trying many of the others around. Surprised you didn’t include that. The adware problem in FileZilla is caused by sourceforge, that site has been repacking quite a few software packages and filling them full of crap to make money off the back of popular software. A quick search for sourceforge adware will give you quite a few results. The version from the FileZilla site is free of any added programs. Another note on FileZilla is that will it is easy to use you should not save your passwords in it as they are saved in plain text and if you do get malware on your computer the usernames and passwords for all your sites can be easily stolen.